I love parasitic plants and I love liverworts. Imagine my excitement then when I learned that there are at least two species of parasitic liverworts! These bizarre little plants are currently the only parasitic non-vascular plants known to science. The first description of a ghostwort dates back to 1919. Although no description of habitat was given, the account describes a set of liverwort thalli containing no chlorophyll and whose cells were full of mycorrhizal fungi. They were assigned to the genus Aneura and that was that. Further descriptions of this plant would not be made for more than a decade. A ghostwort gametophyte with spike-like sporophytes. Proper attention was not given to this group until the 1930's. More plants started turning up among the humus and mosses of forests and wetlands throughout Finland, Sweden, and Scotland. A more thorough workover of specimens was made and the plants were moved into their own genus, Cryptothallus, which accurately captured their subterranean habit. They were given the name Cryptothallus mirabilis. Another species of Cryptothallus was discovered in Costa Rica in 1977. It was named Cryptothallus hirsutus. Only one other collection of these species was made and it remains the lesser known of the two species. It is interesting to note the disparity between their ranges, with C. mirabilis inhabiting northern portions of Europe, and C. hirsutus only known from those two collections in Central America. Regardless, these odd liverworts have received a bit more attention in recent years. It seems that the ghostworts manage to capture the attention of anyone who looks hard enough. For instance, a handful of attempts have been made to cultivate ghostworts in a controlled lab setting. Originally, plants were grown exposed to varying levels of light but try as the may, researchers were never able to coax the plants into producing chlorophyll. It would appear that these tiny liverworts are in fact some sort of parasite. Spike-like sporophytes with a branching gametophyte. Proper evidence of their parasitic lifestyle was finally demonstrated 2003. Researchers were able to grow C. mirabilis in specialized observation chambers in order to understand what is going on under the soil. As it turns out, those numerous mycorrhizal connections mentioned in the original description are the key to survival for the ghostworts. The team showed that the ghostwort tricks fungi in the genus Tulasnella into forming mycorrhizal connections with its cells. These fungi also happen to be hooked up to a vast network of pine and birch tree roots. By tricking the fungi, into an association, the ghostworts are able to steal carbohydrates that the fungi gain from the surrounding trees. Like all mycoheterotrophs, the ghostworts are essentially indirect parasites of photosynthetic plants. Their small size and relative rarity on the landscape likely helps these plants go unnoticed by the fungi but much more work needs to be done to better understand such dynamics. Ghostworts look more like fungi than plants. In 2008, phylogenetic attention was paid to the ghostworts in order to better understand where they fit on the liverwort branch of the tree. As it turns out, Cryptothallus appears to be nestled quite comfortably within the genus Aneura. Because of this, the authors suggest disposing of the genus Cryptothallus altogether. Outside of simply placing this species back in its originally described genus, it affiliation with Aneura is quite interesting from an evolutionary standpoint. 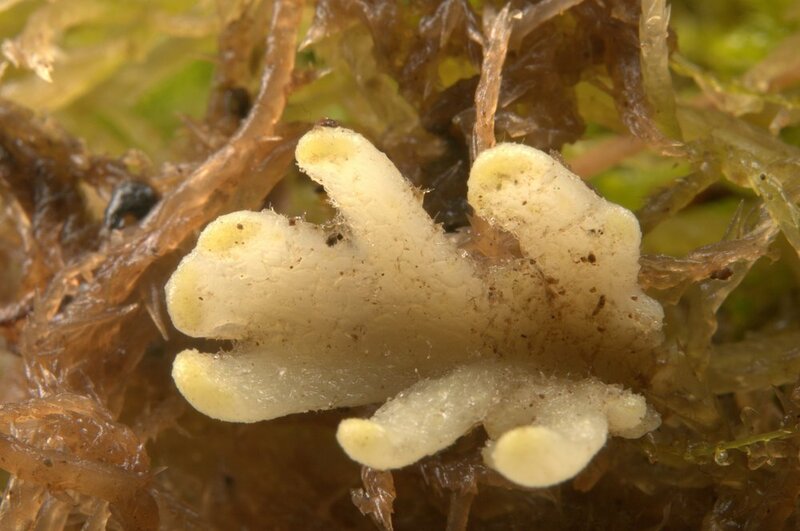 Other liverworts in the genus Aneura are also known to form mycorrhizal relationships with Tulasnella. Unlike the ghostworts, however, these liverworts are fully capable of photosynthesis. Because these intimate fungal relationships were already in place before the ghostworts began evolving towards a fully parasitic lifestyle, it suggests that the saprophytic nature of Tulasnella fungi may have actually facilitated this jump. The cryptic nature of the ghostworts has left many a botanist wanting. Their subterranean habit makes them incredibly hard to find. Who knows what secrets this group still holds. Future discoveries could very well add more species to the mix or, at the very least, greatly expand the known range of the other two.